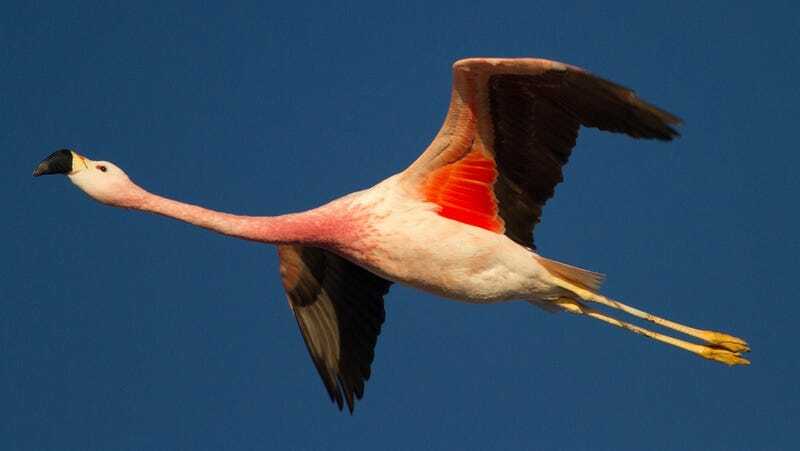 The radiant plumage of flamingos wouldn't be possible without their special diets. Neither would the color of salmon, or koi. The right food can even dye humans - especially babies. At a zoo I visited, I noticed the food trough for the flamingos looked like someone had poured fluorescent pink paint into it. It did not look appetizing, but the flamingos (and local birds) chowed down. If they weren't willing to eat that stuff, they probably wouldn't have been at the zoo very long. They'd have devolved into oddly-shaped white birds. Flamingos don't grow those brilliant pink feathers on their own. They eat shrimp and blue-green algae to brighten themselves up. Yes, blue-green algae. The algae contain carotenoids - a group of pigments that are generally found in plants and other photosynthetic organisms. The pigments are found inside plant cells, in the organelles that conduct photosynthesis. Birds are not the only animals whose special diets enhance their colors. Koi, the gold and red decorative fish, are often fed color-enhancing carotenoids. Koi can get some carotenoids from the algae environment, but most owners tamper with nature a little and feed them diets enhanced with more carotenoids to bring out the brilliant orange and red shades that made them famous. Again, it's a tricky business. Too much will sometimes turn the whole fish yellow. Carotenoids aren't just fed to exhibits and pets. If you walk down the grocery store aisles, you'll often see farmed salmon on display. Usually, somewhere on the package, you'll see a notice saying that "color" was "added" to the salmon to make it pink. But that color wasn't necessarily added after the fish was dead. In the wild, salmon feed on algae and shrimp and get a nice orange-pink color to their flesh. Farmed salmon flesh looks gray unless the fish are also fed carotenoids. The bright pink flesh looks healthier, and, for the consumer it is. We transform carotenoids, like beta-carotene, into vitamin A, which is why every nutrition unit stresses that we should eat "a rainbow of foods," from orange carrots and sweet potatoes to red peppers and green broccoli. We need them to stay alive. Sometimes, however, we overdo it. Even humans are dyed by carotenoids. Those fair-skinned types who are overly concerned with looking tanned in winter will take carotene pills, which deliver massive doses of carotenoids and turn them orange. In general, though, the social group most likely to come down with a case of orange flesh is babies. A lot of alarmed parents take their kids to doctors and are handed a diagnosis of carotenemia. As children move to solid foods, most parents are eager to stuff them full of good vegetables. Carrots, sweet potatoes, and broccoli are favorites. Each of these is full of carotenoids, and they eventually show up in the skin. The excess of carotene first appears on the nose and the palms of the hands, and can sometimes be seen elsewhere on the body in babies with lighter skin. Although the appearance carotenemia can be a sign that things have gone badly wrong with the liver, kidneys, or thyroid, the condition is not dangerous in itself. Too much vitamin A can do damage, but the body converts carotene to vitamin A so slowly that there's no real danger of an overdose. So if you want to pop a pill or eat nothing but broccoli, sweet potatoes, and carrots, you probably won't do yourself an injury. You'll just damage the eyes of everyone around you.